Der Teufel and Henry Miller capture Jimmy Olsen and use him as bait to trap Clark Kent. The Man of Steel confronts Miller and is again weakened by the radioactive kryptonite in his veins. 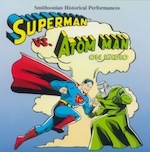 Activating his converter, the Nazi agent becomes the Atom Man and turns his deadly radiation against Kent.